Karan Anand is a Management Consultant at Deloitte in Sydney. 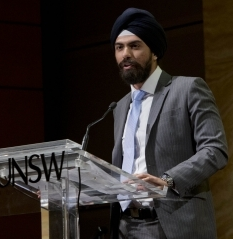 He is also a part time entrepreneur and the inaugural Chair of the Young Sikh Professionals Network (YSPN). At Deloitte, Karan consults on matters of strategy to executives of large publically listed companies focussed on the Financial Services and Consumer Business industries. Karan also leads YSPN, which was founded in 2012 with a mandate to create the conditions for young Sikh professionals to succeed and amplify their influence. YSPN has active chapters in Sydney, Melbourne, Brisbane and Perth and a management team of >40 people. Karan also serves as a Director for the Indian Sub-continent and Crisis Support Agency (ICSA). Karan has a particular interest in the relationship between India and Australia from an innovation and entrepreneurship perspective. Amongst his achievements, Karan was a delegate to the Brightest Young Minds forum in Sydney; a delegate to the National Student Leadership Forum in Canberra and part of an Australian delegation to The Hague International Model United Nations. In 2005, Karan was Darwin’s Young Citizen of the Year. Karan has a Bachelor of Commerce and a Master of Finance both from UNSW where he was the Goldman Sachs Postgraduate Award winner.